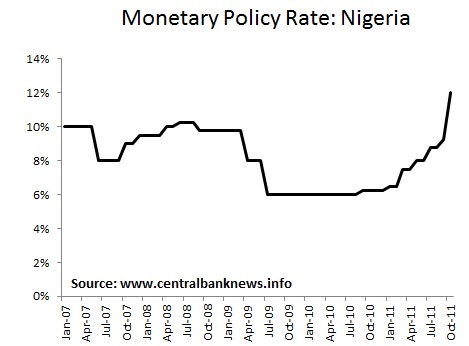 The Central Bank of Nigeria hiked its monetary policy interest rate by 275 basis points to 12.00% from 9.25%, after convening an emergency meeting as a result of heightened global uncertainty and a desire to preserve the value of its currency, the Naira. The Bank also voted to raise the cash reserve ratio to 8% from 4% previously. Bank Governor, Lamido Sanusi, said: "The global economic horizon remains highly uncertain, with the signs getting more ominous as policy makers find it increasingly difficult to take the necessary economic decisions that may avert a new wave of recession." "Three self-reinforcing negatives continue to define the global economy: the sovereign debt crisis in the Eurozone, significant undercapitalization of internationally-active banks, and negative market sentiment leading to continuing flight to cash as a safe haven and deleveraging. 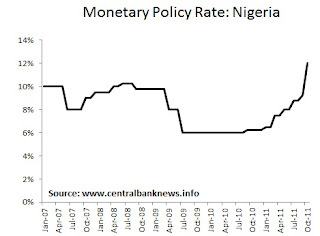 The first and second aspects intensify the third, and without confidence and some appetite for financial assets and credit, the debt crisis and financial solvency concerns in turn become deeper"
Previously the Nigerian central bank raised the the monetary policy rate by 50 basis points to 9.25%, after hiking the rate 75 basis points to 8.75% in July, and increasing it by 50 basis points to 8.00% at its May meeting this year. Nigeria reported annual headline inflation of 9.3% in August, down from 9.4% in July, 10.2% in June, 12.4% in May, 11.3% in April, and 12.8% in March, but within the Bank's inflation target of 10%. The Nigerian government doubled the minimum wage to 18,000 Naira recently. Nigeria reported annual GDP growth of 7.72% in the June quarter, after growing 7.43% in the March quarter, while the Bank is forecasting 2011 growth of 7.8%. Nigeria's currency, the naira (NGN), has weakened about 8% against the US dollar so far this year, with much of the weakness coming in the past few weeks. The USDNGN exchange rate last traded around 164.25.